It would prove to be a saving grace: the threat of a players’ strike in 1961 finally brought an end to the maximum wage in English football after 60 years. (You can read a superb discussion of the issue and its history here). At the same time, Clough became a leading player at a leading club, albeit one not enjoying the best of fortune, and for the first time in his career was earning “top money” as Alan Brown had put it. The abolition of the maximum wage didn’t mean the end of the scandalous retain-and-transfer system – that would have to wait for George Eastham to put his head on the block two years later. But so unusual was it for Clough to be in the right place at the right time that the strike and abolition stand out. And how typical of Clough’s career that an injury requiring a long recuperation should occur only a year later, preventing him from making the most of his first real financial opportunity. Had he left Len Ashurst’s pass, Sunderland might have had another 15-20 goals that season and been promoted; Clough’s eighth professional season would have been a glorious head-to-head with Jimmy Greaves, perhaps even including a revival of his England career. Clough’s England career was definitely hampered by playing in Division Two. Sven Goran Eriksson was criticised for favouring players with Champions League experience, but forty years before, much the same bias was exercised with regard to the First Division. The greatest centre forward of his day, Tommy Lawton, accepted a transfer to Notts County of Division Three in an attempt to shore up his financial future. To the dismay of his England colleagues, he was ignored by the selectors soon after, and the national squad went to their first World Cup without him. Clough’s own intelligence and impulsiveness put off the clubs who might otherwise have brought him into contention with Greaves and Kevan earlier, but it was the retain-and-transfer system that did him most damage. 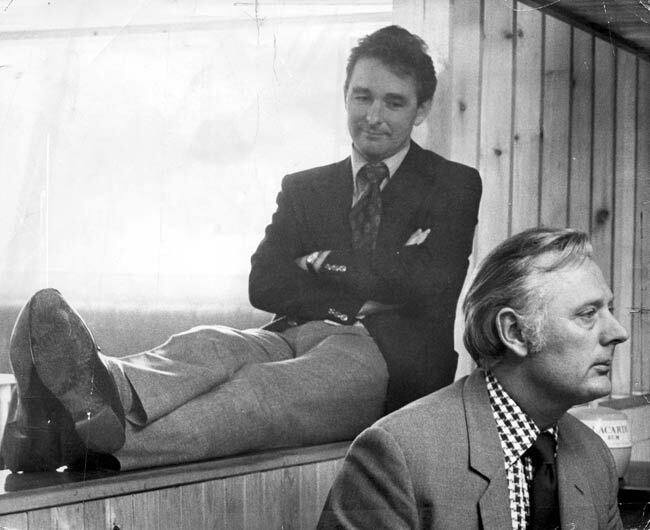 Once Clough was allowed out of bed after his injury – months and months of frustration and boredom, coupled with the despair of watching Sunderland fall just short once again – it would take him another year to recuperate. Hellish recuperation: hours of running up and down the stands at Roker Park, rebuilding the muscles in his thighs and calves that would, more than ever before, have to support his weakened knee. In retirement, Alan Brown claimed that he had always been aware of the severity of Clough’s injury, and that the long afternoons slogging up the steps had been meant to allow Clough to realize for himself what he was up against. A year is a long time, though, and Clough was not a man to forgo demanding answers as to his likely future. Clough was a huge talent, and Brown would have been as desperate to see Clough back on the pitch as was the player himself. Just when it was finally going well, just when there was real direction to life, Clough was obliged to spend his 28th year in pain, in soullessly repetitive recuperative exercise, unable to help his side or his own interests. The fear and frustration that lay just below the surface of this character so many thought to be confident, the impulsiveness, the sharp intelligence denied its rightful challenges, all told once more, as they had told at Middlesbrough. Clough quickly lost what friends he had in the dressing room. Len Ashurst thought that Clough was changed by the experience. Clough had always had a good relationship with the press, but now that began to take centre stage, and some of Clough’s own playing colleagues, Ashurst included, came in for personal attack. Ashurst also thought that Clough changed his accent, deliberately, at this time, beginning to drawl his words. Simon Barnes put it well: “personalities” become that way because their real personality is inadequate in some way. Clough had always been too smart, too interested, too articulate, for the head-down party-line locker-room atmosphere of English football. His mental compatriots were Scottish – Bremner, Lorimer, Johnstone, Baxter, Law. Imagine that mind in constant pain, worry, fear for the future and – as a provider for his young wife and family, precarious – and a reaction seems inevitable. Ashurst, though, was merely reading the future into the past. Clough didn’t remodel himself whilst injured; didn’t refit his psyche and behaviour for the years to come. What years to come? Either he recovered from his knee ligament injury, or there were no years to come. Sunderland won promotion in the early summer of 1964, without Clough’s help. Alan Brown left the club shortly afterwards. The new manager was George Hardwick, an outstandingly handsome man (friendly with, amongst others, Ava Gardner) who had been captain of the great English post-War national teams. A man of dominant, self-confessedly bullying character, he had had his career ended by a knee injury. Clough was just a striker with a long term injury when he arrived, but one fighting for fitness with determination with one hand whilst alienating the rest of the camp with the other. Hardwick gave Clough something to do. Clough was to help train the youth team. Much has been made of Clough’s approach to the Sunderland youth team, and not enough has been made of George Hardwick’s influence on the way it was run. For Hardwick hadn’t come to Sunderland out of the blue: he had managed both PSV Einhoven in Holland and the Dutch national team itself. It was whilst Hardwick was in the Netherlands that their football began to emerge – in 1967, only six years after Hardwick left, Ajax were to thrash Liverpool 5-1 in Amsterdam before drawing 2-2 at Anfield. George Hardwick is one of the names that are regularly accredited with the invention of what would become Total Football. The Sunderland youth team’s survivors of the period tell of how they were taken away from endless lapping of the pitch and put into six-a-sides, skills training, change and variety: this cannot, in the circumstances, have been Clough’s doing simply because, at first, he wasn’t even officially Sunderland Youth Coach. Hardwick’s influence has to be taken into account. That Clough found the work congenial is true enough, but there are no signs that he had any intention at all in life other than to continue playing. Assertions that he had thoughts of his own about coaching and management at that stage are probably false. But, asked to do it, it seems that he could. And he was lucky, because Sunderland had a golden youth squad at the time, who were about to dominate the FA Youth Cup. With Clough’s help, they reached the semi-final in 1964. They’d reach the final in 1965, and win the competition outright in 1966 and 1967. Hardwick wouldn’t be there to see it. Despite taking Sunderland to their highest post-War league position, he was sacked in the summer of 1965. But not before witnessing Clough’s return to the first team, or his first goal in the First Division, scored against – who else? – Revie’s Leeds. Clough’s was one of the great recoveries from injury. To return to the first team after eighteen months of pain, tedium and conflict was an outstanding achievement. But Clough was trapped in the 1960s, forty years away from the treatments that would have, in all likelihood, taken his career on into the 1966 World Cup. Sunderland had done their best for him. But even in that game against Leeds, in the moment of vindication, it was impossible to miss two things. One, that Clough had lost all of his pace, and didn’t trust the knee enough to run on it as he had once done. Two, that he was limping. A less intelligent man would have been amongst his intellectual peers in football. Clough was too young and too sharp, too desperate and ambitious, all at the same time. Too many important people around him were intimidated by him, and chose to regard that as an unforgiveable sin in a man whose allies were conveniently fragile. Hardwick was Clough’s protector by the end, at Sunderland. Shortly after the manager was fired, Clough, too, was sacked. August 1965 saw the start of England’s World Cup winning season. Neither Martin Peters nor Geoff Hurst, scorers of the four goals in the final the following July, had yet played for England. Greaves, Clough’s closest equivalent in terms of ability in Division One, enjoyed only a fraying relationship with England manager Ramsey. The chance, for a hard-working striker of supreme talent, at his peak, was there to be taken. At Clough’s testimonial, in October 1965, Len Shackleton described Clough as the greatest striker he had ever seen – a man who, had he been playing in the 1920s, would have eclipsed even Dixie Dean. Football saves so much of its empty hyperbole for men it has betrayed and abandoned, but Shackleton was a friend; he meant his words as comfort, but he might well have meant his words. 31,000 people turned up for the testimonial, to Clough’s lastiing gratitude; that, plus his £1500 settlement from Sunderland, almost – but not quite – kept the wolf from the door. It’s hard now to properly communicate the scale of the disaster that overcame Clough in the spring and summer of 1965. The one thing that had saved him from his unsuccessful education, at a time when that was so often the decisive factor in the direction of the next fifty years, was gone, forever this time. The one thing he had been good at, that had won him the status and recognition of his peers, that excited him, gave him direction, meaning, purpose – gone. With nothing to replace it. And, for all his careful husbandry and second income from journalism, nothing to pay the bills. Not only was the life he loved absolutely over, but his domestic situation was desperate and worsening, with a drastic decline in his living standards – and his own childrens’ chances in life – only weeks away. Over the course of the summer, eyewitness accounts say that Brian Clough began to drink to excess, put on weight, withdraw, become depressed. Up and down the country, other men were in the same situation. Football, that great supposed repository of all the good old virtues, in the good old days of ’66, spat out what it couldn’t use, with little, or, usually, no, thought for what lay ahead for them. It would have done nothing to prepare them for the future – testimonials were all that would be provided, and only after a certain length of service, and only if the club could not really avoid providing one. A strange, brief, mostly poorly-paid career, then: spent either trapped at a mediocre employer uninclined to use his talents or to release him to use them better elsewhere or at a good employer but unable to work, in a culture that was dead set against his kind of bright, ambitious, impulsive young man – and it ends, or must have ended, in one final walk out into the club car park. You can imagine how that must have gone: Clough beside his car, digging in a pocket for his keys, and, as he turns them in the driver’s door lock, he perhaps catches sight of his reflection in the window for a second. His face there, and, up and down England, hundreds of other faces caught in car windows as they prepare to go home and tell their families that they are on the dole. What would Clough have seen in that brief moment? “Cloughie”? “Old Big ‘Ead”? I think he’d have refused to look; I think he would have turned away rather than see his reflection just then. Footie books, orange with nostalgia, will note that the Sixties were swinging, that the nation was a blur of mini skirts and mop tops and fashion and satire and plastic furniture and James Bond. In the north east, that other staple of 1960s life, the balance of payments deficit, would have been the only relevant one: Clough’s youth, for all that he had hated industrial life, had been one of expanding employment and relative opportunity. Clough’s sacking came when all that was over and the long, long decline beginning. It’s a story of how poor opportunities were for the intelligent working class boy; of how intelligence put people at odds with the closed, paranoid culture they emerged from; of a “national game” that used both supporters and players unforgiveably, covering its tracks with nostalgia and moulding-flashed patriotism; of a game that behaved more like a cult than a proper sport, keeping its best practitioners back for the lowest cultural and financial reasons. I don’t think Clough would have looked at his reflection; I think he’d have turned away.